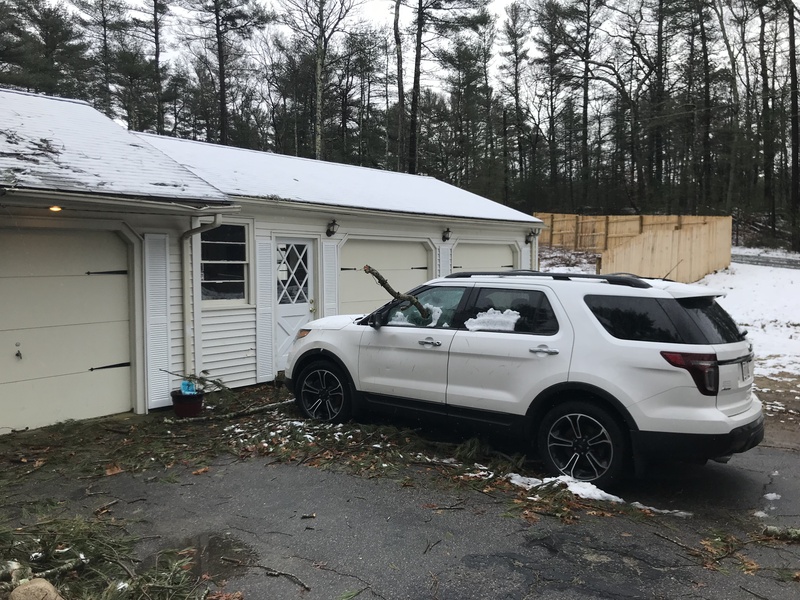 Plympton Police Chief Patrick Dillon described the ordeal of Superstorm Riley as “something out of a horror movie!” In the height of the storm, trees were swaying, cracking, and breaking, falling and bringing down everything in their path. The spectacle of trees on homes and massive limbs spread across front yards could be seen throughout Halifax and Plympton as South Shore towns bore the brunt of Mother Nature’s force over 48 hours, from Friday noon, as winds began to gather and swell, through Sunday noon when they finally began to ease. The storm sadly proved fatal, taking the life of Plympton resident Ryan MacDonald, 36, who was killed Friday night around 5:30 p.m. after being hit by a fallen tree in his Dodge Ram pickup truck. Crews had trouble reaching him due to blocked roads and trees across Cedar Street, said Plympton Fire Chief Warren Borsari. At right Captain Jeff Cuozzo on scene at the Halifax house fire on Oak Place Monday night March 5. First responders continued to field calls on Tuesday in Plympton reaching more than 100 storm-related calls by mid-day. A tangled web of electrical wires remained on the ground at Prospect Road and Winnetuxet in Plympton late Monday as line crews were being dispatched to the area to repair and replace visibly damaged equipment. During the height of the Nor’easter Plympton lost power in 99 percent of homes, according to Chief Borsari. A neighbor on Crescent Street reported a whooshing sound and odor pointing firefighters towards a propane tank that had been sheared off by a fallen tree. They safely shut down the tank without injury. The majority of their calls dealt with trees on homes, wires down and water issues. 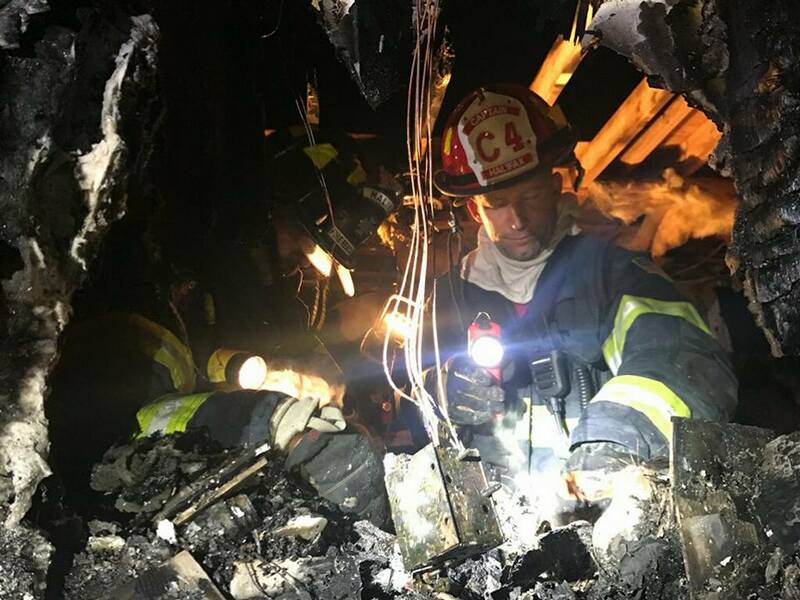 Halifax firefighters battled a structure fire Monday night while still handling calls resulting from power outages. A homeowner on Oak Place had left his residence due to the power outage. Luckily a neighbor spotted flames at the house and alerted 911. Significant damage was done to the home. Firefighters were challenged by the distance to a hydrant, and needed approximately 1800 feet of hose to reach the fire, Halifax Fire Chief Jason Viveiros told the Express. Flames were visible at the back of the house when firefighters arrived. Early estimated structure damage was $150,000 leaving the home uninhabitable. Calls in Halifax totaled 114 throughout the storm and two days following. They had a total of 26 homes struck and damaged by trees. “Firefighters were in dangerous conditions while they were evacuating others… trees were falling all around. But they continued on to the next call,” Viveiros said, commending the town’s first responders. The Chevrolet Tahoe that belongs to the Halifax Fire Chief was heavily damaged by a tree falling on his vehicle during an evacuation on Fuller Street. Halifax Mobile Estates was hard hit with 17 homes affected by fierce winds and falling tree limbs. A portion of the park was evacuated as a precaution due to trees that were leaning and considered an immediate threat to the safety of residents. A warming center was opened at the Halifax Elementary School. Fourteen residents were housed overnight at the school and assisted by the C.E.R.T response team. Viveiros thanked volunteers and Walmart of Halifax for providing supplies at the warming center. Department support and mutual aid for a house fire was provided by Hanson and Pembroke on Monday, March 5. First Responders also put out a small structure fire and an appliance fire during the storm. Plympton opened a warming center Saturday morning at the Town House, according to Lt. John Sjostedt of the Plympton Fire Department. It remained open 24 hours a day through Monday at about 4 p.m. and is ready to re-open should conditions demand. Eversource restoration estimates and maps were updated on Tuesday, March 6, by town listing Plympton as being fully restored by Tuesday at 5 p.m. Much of the time during Winter Storm Riley, Plympton was in the top five communities without power, a dubious distinction. Plymouth County listed only 403 residences without power of the 30,999 served by late Tuesday afternoon.